Lovely choker that is delicate-looking but very sturdily crafted. OMG! This lace mask is amazing. I'd been eyeing TotusMel's work for a while and am so happy to finally own some of their pieces. Makes me feel like I'm an extra in the Labyrinth! Stunning, beautiful, delightful! I love this mask! It's my second one, custom-made in different color, & just as perfect as the first. These look so delicate but hold up for years & go with many costumes. I also like that I can discreetly wear this over small eyeglasses & they're hardly visible. Only the wonderful mask is seen. Lovely artist to work with & speedy shipping too! Highly recommended. 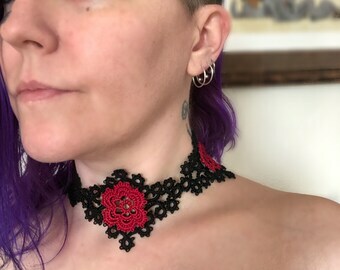 Just finishing up this tatted choker. Ooh, look 4 brand new Armenian lace necklaces listed and ready to ship. Just remade and listed this tatted cuff bracelet. Threads and needles and scissors, oh my! I wish that I had a wonderful story about how I learned tatting at the knee of my grandmother, or discovered a lost family relic and chose to learn this lost art to resurrect it from the darkness. The truth is much more mundane. I was bored with knitting, crochet and sewing. I wanted to find something new to do with my hands and I found tatting. I didn't know what it was, but I knew I had to learn how to do it. With the help of a single book and the internet, I taught myself. Then I got immediately bored with doilies, bookmarks and edgings and put it away. It wasn't until a bookmark I had made was mistaken for a bracelet that the stars aligned and I started designing. Tatting is my meditation, my artistic outlet and the thing that keeps my hands busy much of the day. This shop is not only my job, but my excuse to keep creating and stretching my skills, to expose tatting to every corner that I can. Tatting is not a lost art. I found it and now so have you. I tie knots in thread with the help of a needle. I do this everyday whether I need to or not. I love needle tatting and I want you to own my pieces! All my pieces are created from modified vintage patterns or completely original designs. I work in a smoke free, cat friendly environment and all pieces are pressed and well packaged before shipping. I do not accept returns or exchanges on any custom items. Other items may be eligible for return or exchange if they are in unworn and sellable condition after contacting me for details. For sanitary reasons worn items Cannot be returned. Please order carefully and contact me with any questions or concerns. I want everyone to be happy with their purchases! I accept payment via paypal and credit cards though etsy. Please note: All California residents, 8.75% sales tax will be added to your purchase. I ship all non-custom domestic tatting orders first-class within 1-2 business days. International orders are shipped first class international whenever available*. Expedited shipping is available at additional cost upon request. Custom order processing times are included in each listing and can be up to two weeks. *International buyers are responsible for any and all customs or duties imposed by individual countries. *Please Note due to Italian customs regulations prohibiting "Haberdashery and sewn articles of any kind, including trimmings and lace; handkerchiefs; scarves; shawls, needlework including stockings and gloves; bonnets, caps, and hats of any kind." I cannot ship to ITALY. All pieces are carefully wrapped in white tissue for safe shipping and easy gift giving. I welcome bulk order requests and may be able to offer a small discount, but be advised I cannot accommodate traditional wholesale pricing to retailers. I enjoy the challenge of custom orders. If you'd like to use my tatting in your own projects, I can also make longer lengths of lace for use in sewing projects or scraps for altered art. Feel free to contact me for anything! Many others, including variegated can be acquired if needed. Color pics can be provided if asked.